The new Dominar 400 makes 5PS more power than the outgoing model. Deliveries of the motorcycle will begin in the first week of April. Bajaj has launched the new 2019 Dominar 400 in India at Rs 1.73 lakh (ex-showroom Mumbai). In comparison to the outgoing model, the new bike is priced at a premium of just Rs 11,000. The bike was silently launched by Bajaj’s dealerships across the country, rather than the company itself. Seeing the upgrades that the Dominar 400 has received, the premium feels justified. Deliveries of the motorcycle will begin in the first week of April. Notable updates include new USD forks, a double-barrel exhaust, and redesigned rear view mirrors. It’s powered by the same 373.3cc, liquid-cooled engine which now gets DOHC setup and a revised compression ratio. Aside from this, the bike gets some cosmetic changes to keep it looking fresh. Bajaj has launched the hotly anticipated 2019 Dominar 400 at Rs 1.73 lakh (ex-showroom, Mumbai). That’s a premium of just under Rs 11,000 over the outgoing model. 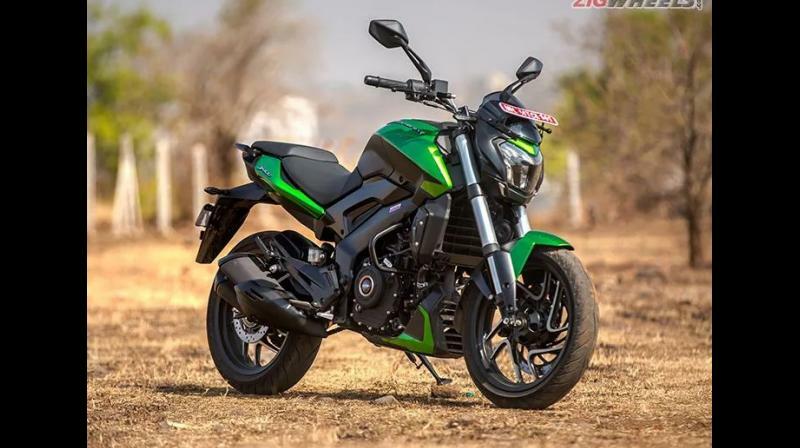 While the company hasn’t rolled out an official launch statement, a couple of Bajaj dealerships across the country have confirmed the arrival and pricing of the bike. And considering the kind of work that’s gone into the updated Dominar 400, we’d say it makes for an exceptional value for money proposition. Deliveries will commence from the second week of April. But before you run to your nearest Bajaj showroom with your cheque book, we’d suggest you have a look at our first ride impressions to better understand what the updated 2019 Dominar 400 has to offer. The biggest update comes in the form of a reworked powerplant. Its 373.3cc, liquid-cooled engine now gets a DOHC (Dual Overhead Camshaft) setup and a higher compression ratio of 12.1:1 instead of the previous 11.3:1. This along with an ECU retune and a new double-barrel exhaust means that bike puts out an additional 5PS at 8650rpm over the outgoing model, which made 35PS at 7000rpm. Peak torque output remains unchanged at 35Nm, although it's now delivered at 7,000rpm, 500rpm higher than before. The motor comes mated to a 6-speed transmission aided by a slipper clutch. Other notable additions include upside-down forks from Endurance, a revised layout for its dual instrument console setup, a new side stand, redesigned rearview mirrors and forged aluminium mirror stalks. The bike’s all-LED headlight receives clever masking to make it look visually smaller while nifty bungee straps placed under the pillion seat make sure your luggage stays in place. Apart from this, the 2019 Dominar 400 goes back to using its original two-tone diamond-cut wheels rather than the gold-painted ones as seen on the outgoing model. Interestingly, Bajaj has reworked the spring rate on the rear monoshock to improve ride quality. Braking duties are handled by the same 320mm front and 230mm rear discs; however, the front disc comes paired with a radially mounted caliper instead of the axially-mounted unit seen on the previous-gen model. The aforementioned updates amount to a total weight gain of 2kg, which puts it at a total of 184kg (kerb). At this price point, the Bajaj Dominar 400 goes up against the Royal Enfield Thunderbird 500 and the new Jawa. We will be sure to test the 2019 Dominar 400 in real-world conditions, so stay tuned to ZigWheels for a thorough road test review. April 2019 waiting period: When can you get delivery of Baleno, Elite i20 and Polo?